Uncovering correspondence between Fred Grunwald and his friends and associates was essential to reconstructing Grunwald's story. For example, the names of a number of European galleries where he bought artworks were revealed in correspondence. The letters below speak to some of the relationships and conversations that helped shape Grunwald's collection. This index card from 1948 shows Grunwald's early efforts to seek redress from the German government. Correspondence between Fred Grunwald and Ebria Feinblatt, former curator of prints and drawings at LACMA. 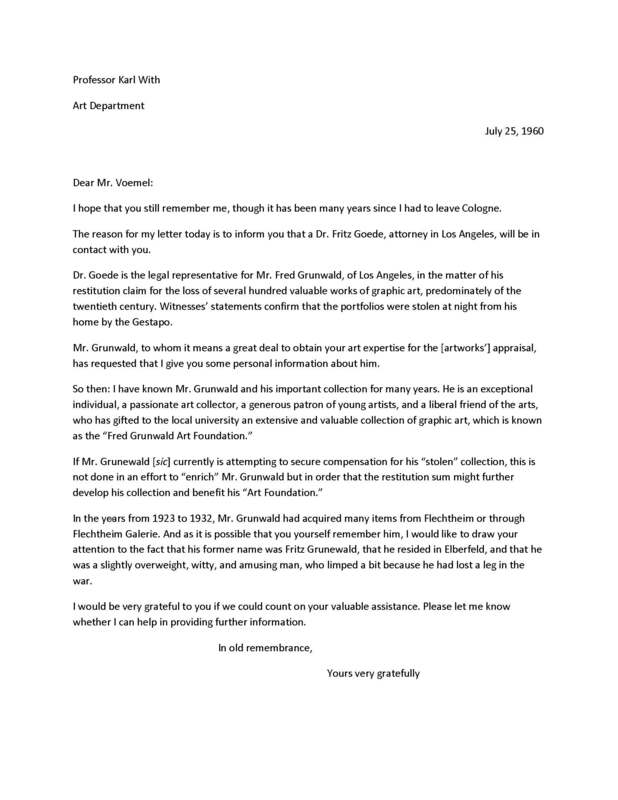 Letter from UCLA art history professor Karl With to art dealer Alex Vömel, dated July 25, 1960, imploring him to submit testimony regarding the existence of Fred Grunwald's art collection in Germany for the restitution claim discussed in the German Archives section of this digital archive. Translation by Kirk Nickel. Letter from Fred Grunwald to rare book dealer Jake Zeitlin, dated February 10, 1964, regarding the founding of a local print discussion group. "Correspondence." Loss and Restitution: The Story of the Grunwald Family Collection. Los Angeles: Hammer Museum, 2017. https://​hammer.ucla.edu/​collections/​grunwald-center-collection/​loss-and-restitution-the-story-of-the-grunwald-family-collection/​historical-documents/​correspondence/​.